This week we take a break from our individual amiibo introductions to do a recap of all the amiibo we saw at E3 2017. This year we were introduced to a total of 13 amiibo. Yep, that’s right not 5, not 10 but 13. So without further ado, let’s jump in and take a look. Some of us are certainly a little disappointed when Chrom was not included into Super Smash Bros. for Wii U/3DS and thus never made into an amiibo. No reason to be sad now, he will be making an appearance with Series familiar Tiki. No official feature has been announced for the two figures except that they will be compatible with Fire Emblem Warriors which launches fall 2017. A little trivia here, Tiki has not been announced as a character for Fire Emblem Warriors yet… So what will the Manakete’s amiibo be used for? Chrom and Tiki will arrive alongside Fire Emblem Warriors this Fall. As the Metroid Series enjoys a little more love this year with two games in the work — one of them coming out not long from now — we get to see two beautiful amiibo figures from the series. While Samus is no stranger to the amiibo franchise, Metroid will be making its first debut. Amazingly, they have managed to make Metroid’s jellyfish-like outer shell squishy. 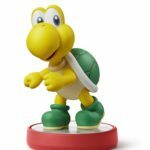 Though it is not the first time we’ve seen amiibo figures being something other than hard plastic (looking at you Woolly Yoshi), I’m still excited to see how squishy Metroid would be. We still don’t know what the amiibo figures can do except that they will work with the upcoming 3DS remake, Metroid: Samus Returns. Metroid: Samus Return will be released on 15 September 2017, no definite date for Metroid and Samus amiibo figures but they should arrive around the same time. When you think The Legend of Zelda could not use more amiibo figures, Nintendo shoves four more down your throat, making The Legend of Zelda one of the bigger non-smash series of amiibo figures. 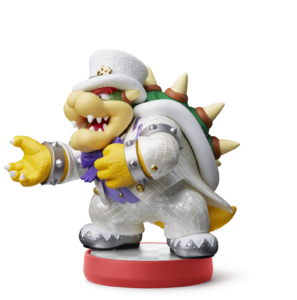 While there is much controversy over the position of the support stick, Nintendo has once again shown that they can turn our favourite characters into beautiful figures. All four heroes will be featured, Daruk, Urbosa, Rivali and Mipha. Though I’m still quite sceptical about Mipha’s face, we can only tell when it finally lands on my table. No word on what the Heroes can do, but I hope to be pleasantly surprised. Daruk, Urbosa, Rivali and Mipha will be released Holiday 2017. 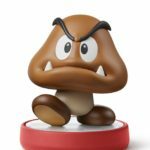 Mario is expecting a grand odyssey this Fall and a few amiibo figures are going to be there to join him. First off is wedding day Mario, Peach and Bowser. Some say Peach should go with Mario. Some say a Princess should go with a King. Some say Peach is in the way of true love. So who knows? All three are confirmed to be compatible with Mario Odyssey but no news on their true features. Then we have Koopa Troopa and Goomba. These two have been chasing Mario since 1985 and they’re finally getting some love from Nintendo. Both of them will be read/write compatible with the upcoming Mario & Luigi: Superstar Saga + Bowser’s Minions, but no exact announcement on what they will do. Mario, Peach, and Bowser will arrive around the same time of Mario Odyssey which is scheduled for 28 October 2017. Koopa Troopa and Goomba should arrive around the launch of Mario & Luigi Superstar Saga + Bowser’s Minions on 6 October 2017. A whole ton of amiibo figures are lined up for this year. The announced list for E3 is already on top of the Smash, Splatoon and Pikimin amiibo figures already announced earlier this year. While as an amiibo collector and enthusiast, I can’t help but be both excited and sorry at the same time. I’m excited at the upcoming roster but my wallet has other words for me. For more news on amiibo figures, do stay with us on NintendoSoup and do leave us a comment or drop us an email if you have anything to voice.